From there, tap New Song and the Songtive smart engine will generate a random chord progression in the chosen corresponding style. 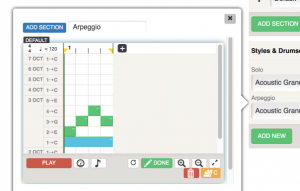 The Song Editor feature consists of two sections. The first is a chord editor which allows you to view all the chords assigned to the song. Tapping on the chord allows you to change it in the Song Editor’s second section. 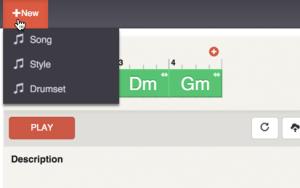 As you can see on the screenshot, the selected chord becomes highlighted. In this example, we’re working with G minor. 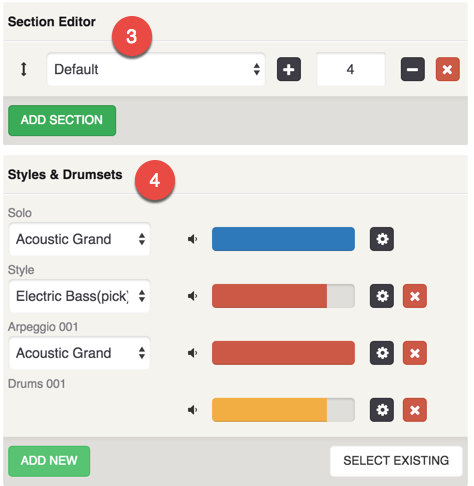 In the Section Editor, you are able to change song sections (#3) and also assign or modify song styles (#4). You are not limited to only using a single instrument, either – simply selecting a new one in the dropdown menus can change it to whatever you like. Tapping the “Add New” button in Styles & Drumset will open a Style Editor where you will be able to specify exactly how each chord will be played. As you can see in this screenshot, we can set the root note to play through the whole bar and then have the following notes to be arpeggiated one by one. For a video tutorial, click here. When you’re done, just tap Save. That’s it! You can now share the song you just created with your friends. Any questions or comments, please contact us at support@songtive.com.